1.2 #Custom ROMs For android devices. 1.3 Don’t know about Custom ROMs? 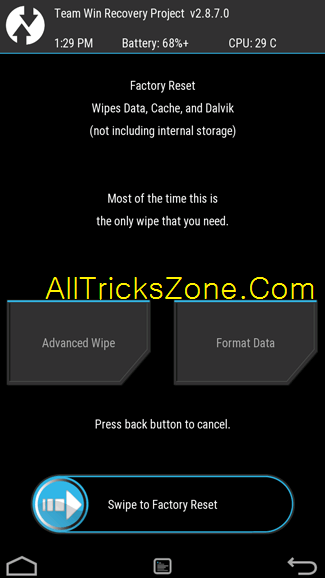 This is the Full guide for all the newbies peoples on How to Flash a Custom ROM in android Device. As you all know that Android has a countless functionality and features,we can do so many things in android smartphone which can’t be done in any other operating system like iPod iPhone Symbian Lumia windows phone. Android provides a lot of options for customization and this is the reason why we love android phones more than any other phones like iPhone, Windows etc. Custom ROMs gives Better UI, features and Good Performance in Android Devices. There are Number of Custom ROMs available for Android Devices. Which You can Choose any ROM, and install in your device of your choice. Make sure your device have good development level on XDA. Though you need to root your device to get most of the android, rooting is best & most important thing you can do with your android smartphone. By getting root access you can do so many awesome things & Various tweaks with your android phone to make it more smarter and Reliable. Checkout this awesome post about best rooting apps :- Top Apps For A Rooted Android Phone. In earlier days rooting process used to be very complicated, but nowadays its very easy to root android phone. Checkout below post to root your android phone. How To Root Any Android Phone Without PC. “Rooting will void your manufacturer warranty “ . After rooting your device you will defiantly regret for not rooting your device before. 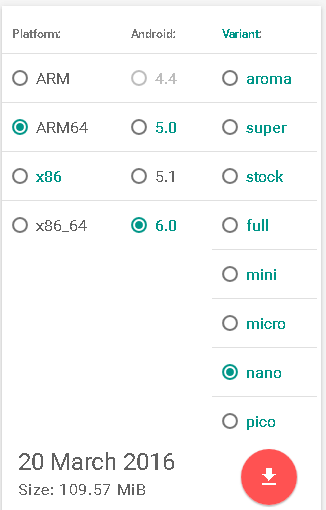 You can check Custom rom availability for your device at XDA. Custom ROM is the biggest advantage of having an android phone, by installing a custom ROM on your android phone you can change the complete system of your android phone like Change Mac Address and Changer Android Id. Most of the android users prefer a custom ROM over stock ROM of their device. Anytime custom ROM is better than a stock ROM because every custom ROM comes up with so many advanced & useful features which you can’t get on a stock ROM. Stock ROMs are for the people who like simple and default system of the phone. In short “Users who don’t want advanced features for their android phone & want their phone to remain same as it came out of the box >:O :/ , prefers stock ROM over custom ROM”. Also checkout How to Install one app Twice in android devices. Don’t know about Custom ROMs? Don’t worry now, here we will tell you what is a custom rom ! Custom ROMs are the modified version of stock ROMs with additional features added in it, there are available different custom ROMs for different devices. You can’t install any other device’s ROM on your device, if you do then you will end up bricking your device or may cause of Soft Bricked/ Dead. One of the reason why users prefer Custom ROM over stock ROM is that by installing a custom you can get the taste of latest version android before your manufacturer release the official update. 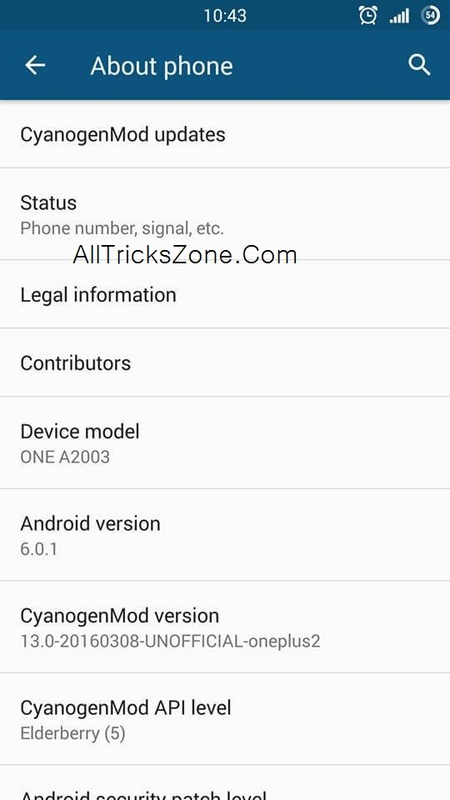 Most of the smartphones don’t get the official update from their manufacturer, but by flashing a custom ROM you can get latest version of android on your smartphone but this is the unofficial Rom you can Switched to Official rom by flashing Stock rom on your android phone. If you want to increase performance of your android device, then checkout How to Increase RAM in android, it will boost up speed of your device for sure for playing heavy games and multitasking. I hope now you know & Understand what is the custom ROM & some advantage of it. Flashing a custom ROM is also very complicated process it may cause of brick your cell phone, many geeks who are familiar with this kinda stuff can make mistake sometimes while flashing a ROM and their phone will be dead. If you are a new user and don’t know about this stuff but still want to flash a custom ROM on your android phone then don’t worry we will give you a step by step guide by which you can easily flash a custom ROM on your device. Follow now from below guide to know how can you flash a custom ROM on your android device with some easy steps. Unlocked Bootloader – If your phone’s bootloader is locked then you need to unlock it first, Check the XDA forum of your device to know the process of how to unlock the bootloader of your phone. If you want to know about install custom roms without unlocking bootloader? Then i want to tell you, Some devices comes with locked bootloader, you can’t flash custom ROM Without unlock bootloader. But some devices comes with unlocked bootloader Like Samsung etc, in those devices you can flash custom ROMs without unlocking boot loader. Custom Recovery Installed – You need to install a custom recovery on your device, you can’t flash a ROM without a custom recovery. Again check on xda to know how can you install a custom recovery on your android phone. this is the important to flash any package through Recovery. After unlocking the bootloader & installing a custom recovery you can flash a custom ROM on your device, you don’t need root access to flash custom ROM on your android phone… though you will go with rooting process while installing a custom recovery. 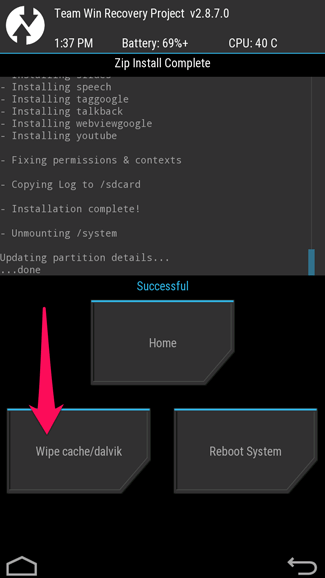 So these was the some basic requirements, for flashing custom ROMs in your android device. 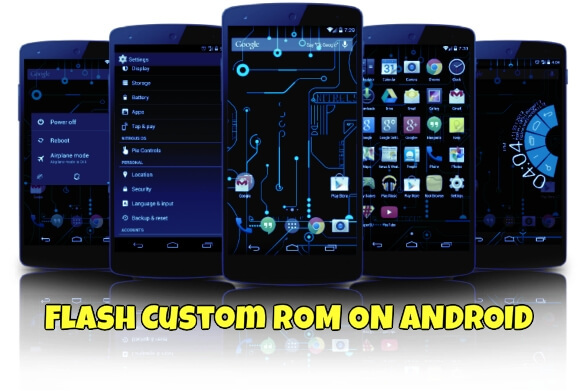 Make sure you have all above requirements, for flash custom ROM in android device. So After prepare all things, check below precautions for installing custom ROM in android device for flashing custom rom in your android smart Cell Phone. As we already said that flashing a custom ROM is a very complicated process. So Please take a Nandroid backup of your stock ROM before flashing a custom, So in case if anything goes wrong you can easily revert back to your stock ROM. so you can take nandroid backup through recovery. And Keep your phone charged before flashing a rom. Pro Top :- If your android phone is rooted then you can take backup using Titanium backup for like Contact, Images, Messages will be deleted so backup it before the flashing custom ROM. So Guys, If you want to Know about how to download custom os for android? Then i want to tell you, all devices have different Custom ROMs as i have already said that. So, You can Download Custom ROM for your device directly from Google By Searching with your device name. Like if i need custom ROM for Oneplus 2 Device, then i will search – Oneplus 2 Custom Roms. like this, we can search custom ROMs for our devices. Checkout Full Step by Step guide about How to Flash Custom ROM in Android Device now from below. you can also Customize your android phone without using Custom ROMs, like you can use custom boot animation in android, But still custom roms are far better than stock ROMs. Check step by step tutorial about How to Flash Custom ROMs in Android phone now from below. Below i am Going to Mention process for Flashing Custom ROM in android device with the help of TWRP Recovery mode. If you have other recovery Like CWM or PHIZ Recovery installed in your device, then you can follow same steps from below interface of Recovery may be Different. So Checkout Step by Step Guide from Below, for Flash Custom ROM in android With TWRP. Now reboot your phone into recovery, turn off your phone & press and hold Volume Up + Volume Down + Power Key to reboot into the recovery. Remember that all Devices have the different method for boot in recovery mode. If you don’t know Key Combination for reboot in recovery, Then Just Search on Google, you will get that. Or you can also use Some apps Like Quick Reboot for Restart your Phone in Recovery Mode. 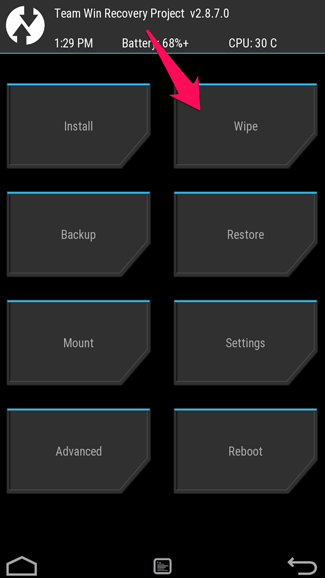 It is recommended to perform a factory reset before flashing a new ROM, So After Open Recovery Mode, You Will See Option of Wipe. Simply Click on It, and Swipe to Confirm Factory Reset of your device. it will Delete all your android data it not be back. Once you are done doing a factory reset, Simply Go back to Main Screen Of the app, and click on install Button like below Screenshot. Now It will Show you File Manager og your device, just Navigate to the ROM, which you was Downloaded for your Device & placed it on your SD Card [Memory Card], and click on It. 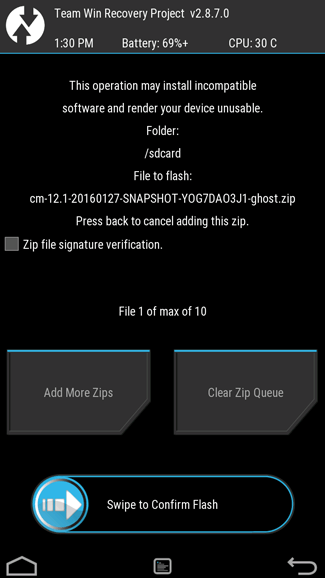 After Select the Custom rom Zip from your SD Card, now it will ask you to Confirm flashing process. So Simply Swipe to confirm flashing of ROM. Wait for few minutes until flashing process finished. It may take up to 5-10 Minutes for Finish Flashing Process. Don’t Be panic, and don’t pull out battery from your device while flashing process. Else may be your Device will be permanently Dead/ Bricked. Now After flashing process finish, it will show you an option of wipe cache & dalvik cache, Click on that, and it will Wipe Cache from your Device for clear the Temp File. Done! Now reboot your phone. It will take some time to finish the first boot so don’t be panic, it may take up to 10 Minutes for boot your device first time after flashing Custom ROM. your Device will be more smarter than earlier. That’s it So this is how you can flash a custom ROM on any android device, this is most common way to flash a custom ROM on any android device, though in some ROMs you need to do a clean flash before flashing the ROM, clean flash means wiping everything in recovery except internal storage. that is important to do. Now enjoy the complete new system on your android phone. If you have successfully flashed custom ROM in your device, then you may notice that there are no Google apps present in the ROM. because, most of the Custom ROMs don’t comes with Gapps pre-installed. You have to manually Download and Flash Gapps in your android device. Below, i will guide you about How to Flash Gapps in android devices easily. So checkout Step by step easy tutorial guide on How to Download and Flash Gapps in Android Devices. After Successfully Download Gapps.zip for your device, Now move it in SD Card, or keep it in Internal Storage of your device for flash google apps package zip in your android device. Now, Goto Recovery Mode from your Device, and Click on Install Zip from SD Card, then navigate to the newly downloaded Gapps Zip file, and confirm flashing process. just like your follow above steps. Now, After Successfully Flash Gapps in your device, Simply Clean Cache from recovery Mode, and Reboot your Device, it will take up to 10 minutes for boot your device after Flashing Gapps. So have patience, and don’t be panic. Don’t remove battery during the flashing it may cause Google Apps Stopped Working. So All Tricks Zone’s This was the Easy way for Downloading and Flashing Gapps in your Android Device. If you want to use play store in your Custom ROM, then you can flash these Gapps in your device. if you don’t want to use Play Store, then you can skip these steps. Remember that Gapps will decrease performance of your device for sure. So make sure you install Nano Gapps package, like i have mentioned earlier, it will not decrease performance in Custom ROM. So This was the easy Guide on Flashing custom ROMs and Gapps in android Devices. Also check How to Replace Kingroot with supersu. This was the complete for the users who don’t know anything about rooting , flashing & other same kind of stuff, you can follow this guide to flash a new custom ROM on your device to enjoy a new and clean system on your android phone. If you have any kind of issue then let us know by commenting below. 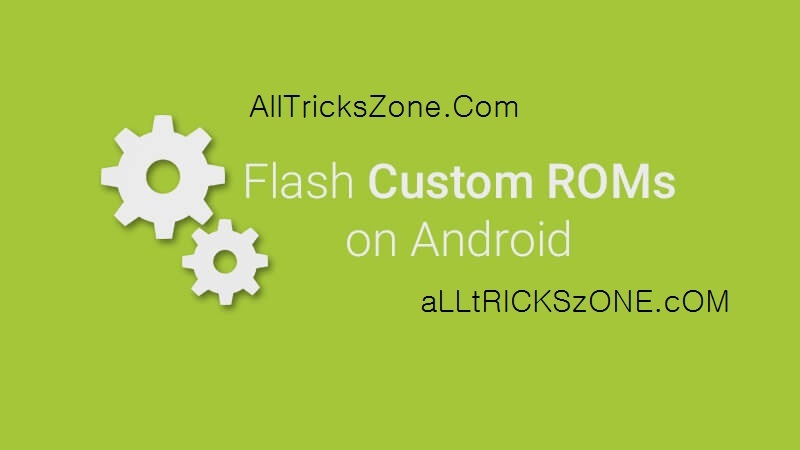 This was the one of the best Guide for How to Flash Custom ROM in Android Device. Thanks for visiting and stay tuned here for more cool stuffs like this. there’s this one thing that is bothering me…. I’m using stock Android 5.0 with kernel version 3.10.54 and chipset Mediatek MT6582M and I want to flash this ROM with same kernel and chipset but it is Android 4.4.2… will this be possible?? I mean is it possible to downgrade to KitKat? ?